As I write this, I’m three hours away from home in the middle of the woods with no electricity, no roof over my head, no running water, and of course no cell reception. Our beautiful spot right on the river. Yes, I know I’m contradicting myself. Like an alcoholic trying to shake the last few drops out of the bottle, I’m writing this blog post in offline mode. But it’s definitely not the same without WiFi. Without an internet connection, I don’t have alerts buzzing every five minutes on my phone. I don’t go to check my email, only to find myself scrolling through Twitter half an hour later with no memory of even opening Twitter. UX Designers like me are paid good money to grab your attention and hold it. And they’re damn good at their jobs. They are great at making everything seem urgent and important, even if it’s not. Out here, it’s just me, family, and nature. We eat, drink, laugh, play games, and just relax. 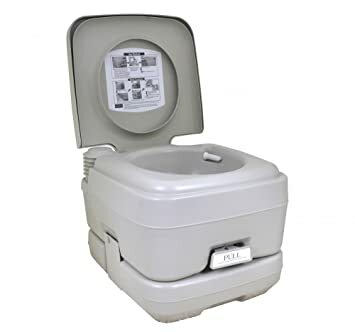 Our luxurious portable toilet is kind of like this. Way better than squatting in the woods! At least what seems urgent and important out here actually IS urgent and important. Speaking of urgent, I need to climb a tree to try to find cell reception so that I can keep my Duolingo streak alive. Wish me luck!